This is a one-day blitz tournament for ages 21+. You must have a valid USCF I.D. to register for this tournament. The tournament will consist of 7 round swiss-system tournament style. Registration is $10. This is a bring your own board event with a cash prize of $250. If you have any questions please contact Taylor at (202) 248-4303 or thall@visualrmg.com. 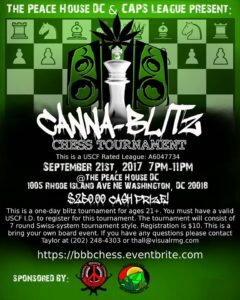 Chess and Politics League was founded and started in July 2016 out of the need for educating black/African and Brown people about their history while incorporating the game of the chess. Chess tends to be affiliated within settler colonialism which makes perfect sense. From that we can learn to break down the system to free our mind as well as well as our body by self-sustainability.